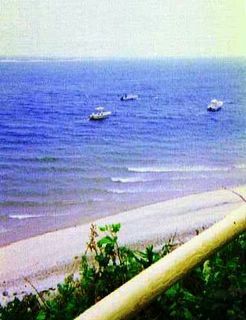 I took this photo one summer day on Cape Cod, several years ago, and edited it tonight to post. 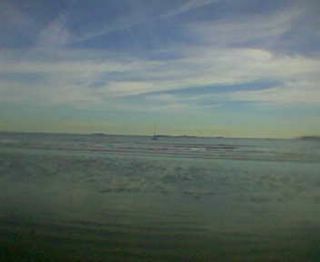 I have been reading Melville, so my head is full of sea voyages and images of New England. Besides, Boston is due for a snowstorm tonight, and everyone is tired of snow, so here's a nice summer image. I am hanging this picture today, and decided to photograph and post it as well. 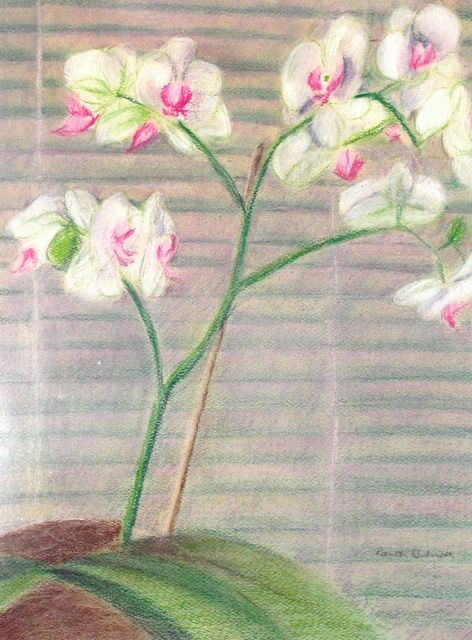 This is a pastel of an orchid plant that my daughter gave me several years ago. I am glad that I made this pastel of such a wonderful gift, because the drawing has outlasted the plant itself, I am sorry to say. (My artistic skill far exceeds my horticultural skill.) Anyway, I have been reading a novel set in the tropics, so an image of a tropical flower seems a good choice for today. 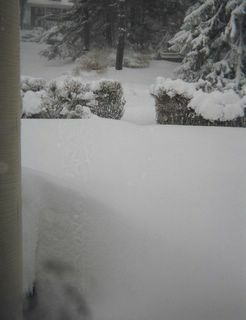 Well, yes, it snowed here again last night, but not this much! This picture is from a roll of film that I took during Boston's January blizzard. I recently had the roll developed, and tonight I loaded the images into the computer. I thought should hurry and post some pictures from what is now an extensive collection of snowstorm photos, because spring is just around the corner. I figure we have only a dozen more snowstorms to go. . . .Anyway, look closely. There's a sidewalk under there somewhere. 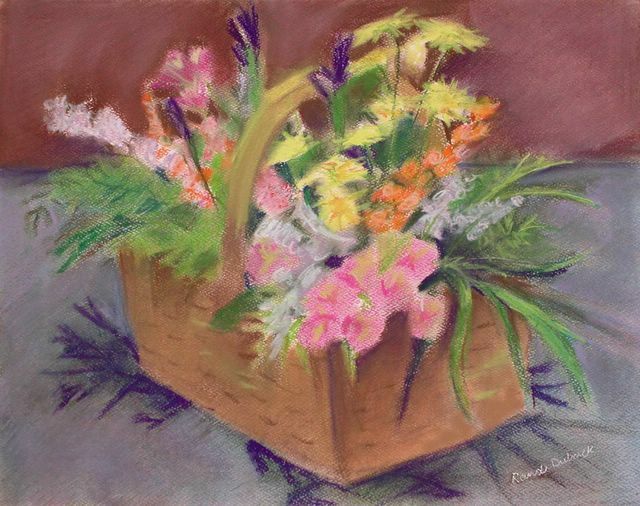 This pastel is of a bouquet that someone sent me, and I loved those flowers. The bouquet is lying on its side because I was trying to dry the flowers to keep them as a souvenir, but because I am not very good at that kind of thing, I decided that the best way for me to preserve the flowers was to draw them. 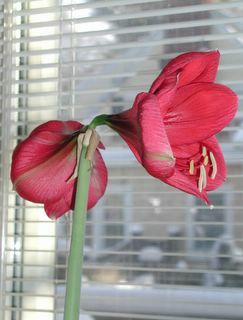 I have been waiting for the amaryllis to open, and today is the day. I took a number of pictures this morning, edited them and debated (with myself and with my son) about which one to post. What I was after was the flower opening against the snow, and the natural morning light coming through the window blinds. I always associate the amaryllis with my mother, who introduced me to this flower that looks so odd, even disconcerting, until it blooms. Then, in the middle of the February cold and snow, the amaryllis opens, reminding us that the earth is moving, the seasons are changing, and spring is inevitable. Snow again, but this time the snow is in Boulder, even though I am in Boston. Colorado seems to be on my mind this week, and on my computer screen, too. The other day, I came across photos that I took on a trip to Colorado a few years ago, so I decided to edit them on the computer, and now will have some new and improved pictures to share with folks from home. 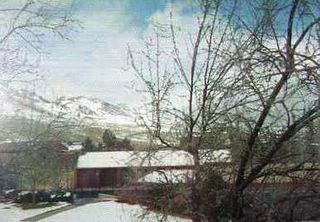 I cropped this image from another photograph, focusing on the foothills which had been lost in the background in the original. I like this picture because it looks like home: the blue sky and the snow on the foothills, visible in the distance through the trees. 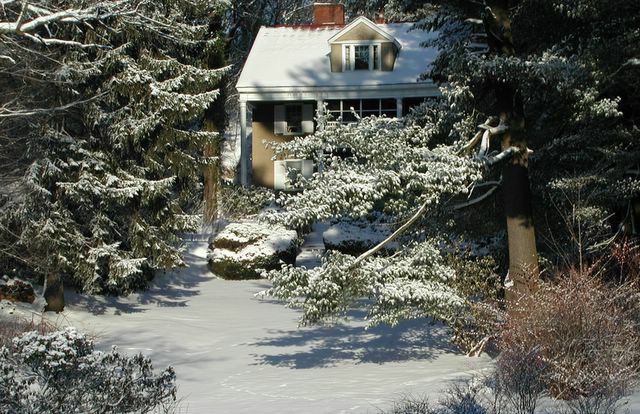 It snowed again in Boston, and it is still coming down, but I have already been outside. 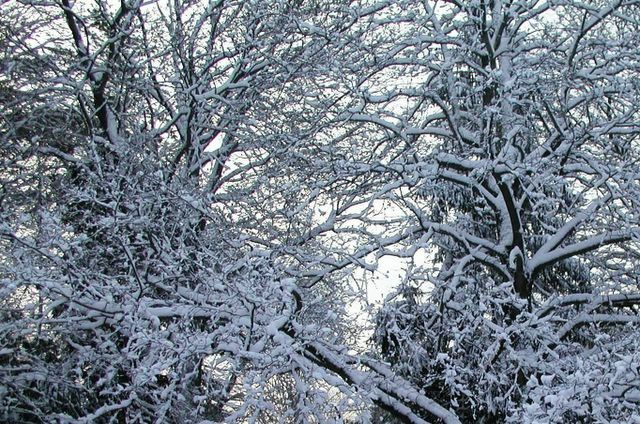 Today I used my digital camera to take a picture of the snow on the branches, then cropped the photo to get this closeup of the surreal effect of branches transformed into clusters of white gloves by the snow. Last night, Mindy and I talked about beads, our shared obsession. That led to this morning's project. During a recent excursion to Essex, Heather bought me some old necklaces so I could take them apart and salvage the beads to make jewelry. This morning, I dismantled the necklaces, and as I worked, I came up with several designs. 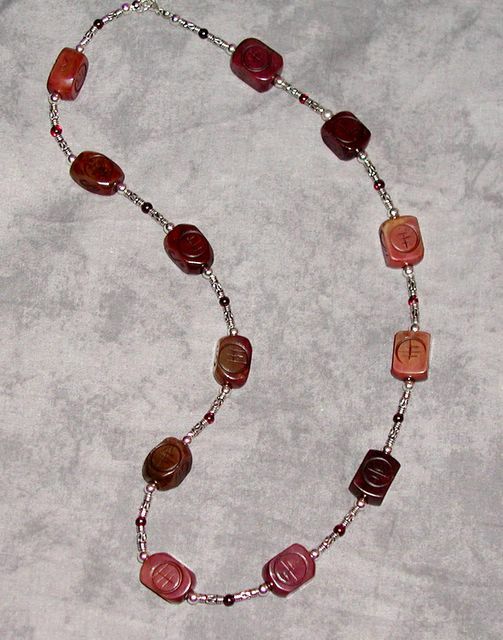 Since there's no finished piece to show for today's work, I am posting a photo of necklace that I made last year from incised jade, garnet, and sterling silver. Last summer, I did this pastel of flowers my daughter planted in a window box. The other night, I took a digital photo of it, and thought I would post it today as a reminder that spring is inevitable. We need the reminder here in Boston because it is very cold today, and snow is expected again on Monday. My friend Pam, also an artist, liked the self-portrait I posted recently, but wanted to see me smiling. So I thought of this one. The smile wasn't exactly intentional. I was painting this as an assignment for a portrait class , while my son and daughter were telling me jokes. Before I realized it, I had painted in my smile. 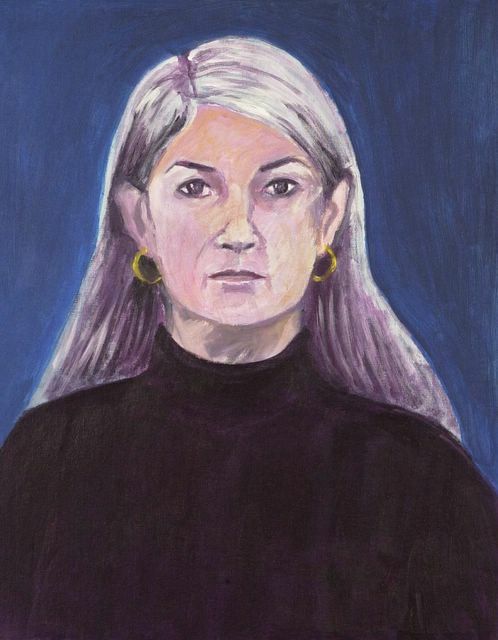 At first I was not comfortable with this portrait, but other people really seem to like it. (Aren't self-portraits supposed to reveal the tortured soul of the artist ?) In any case, I have come to like this painting, if only because it shows how happy I am when I paint. Deja vu? I posted this same pastel two days ago, but today I reworked the background to make it darker so the flowers and leaves would stand out more. I also reworked some of the shadows. I still don't know if this is finished, but it is probably time to go on to the next project. 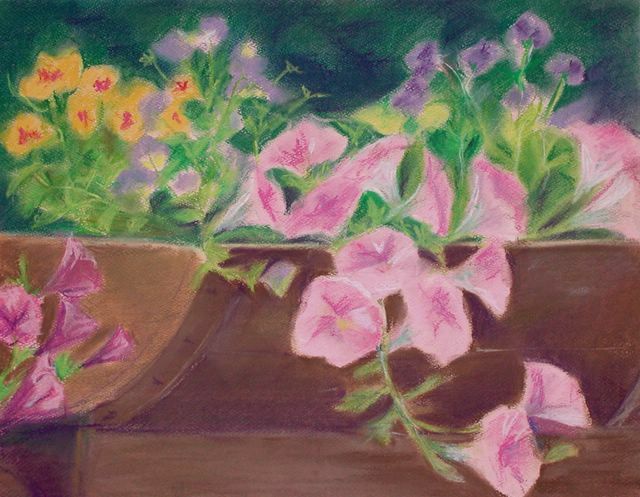 I wanted to draw these flowers before they faded. When people send me flowers, they are also sending me something to draw. 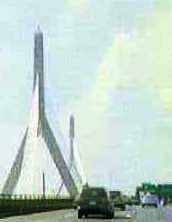 I went to Boston today, so I am posting this image of the Zakim Bridge, a work of art in itself. I love to see the sun hit the cables, but the bridge is also beautiful at night, with blue lights shining up from the its base. And the cables make music as they vibrate. It has been fun to watch the bridge go up since we moved to the Boston area. I took this photo about two years ago, and tonight cropped the original photo and adjusted the brightness and the color of the sky to show the play of the sunlight on the cables. 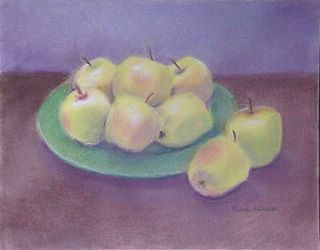 This is a pastel I have been working on tonight, and just stopped working to take a photo to post. Its really too soon to know if this sketch is finished or if it is a work in progress. 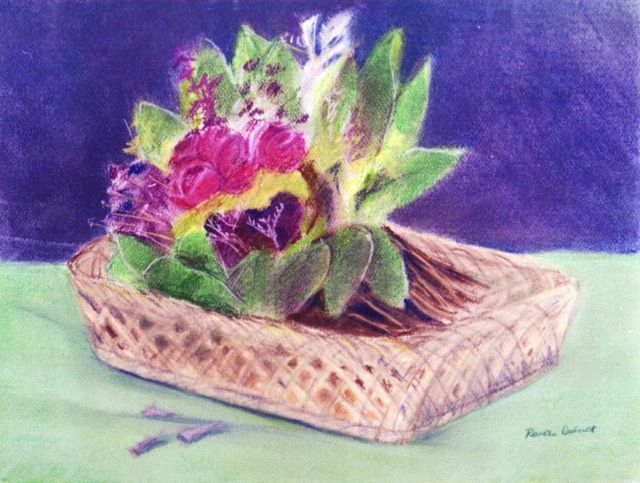 (When I really think I am finished, I spray the paper with fixative to keep the image just as it is. I haven't done that yet, although in a way, taking a digital photo is another way to fix an image.) Anyway, it felt great to work on this and get lost in the endless complications of the flowers, the leaves, and the shadows. I thought this would be a good choice for February 14th. 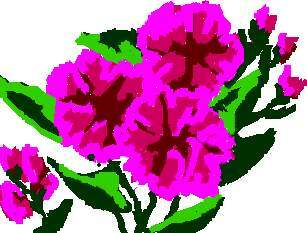 I drew these flowers on my PDA (Clie paint program), and last night, cropped the image and pulled it into Painter IX so I could clean it up a little. It's not exactly lace doily and ribbon, but it is still made by hand (or perhaps I should say made by handheld). No, it's not Maine, though you might think so from the name, and it's not California, though the color and style of the row houses would be at home in San Francisco. This is Northern Ireland! 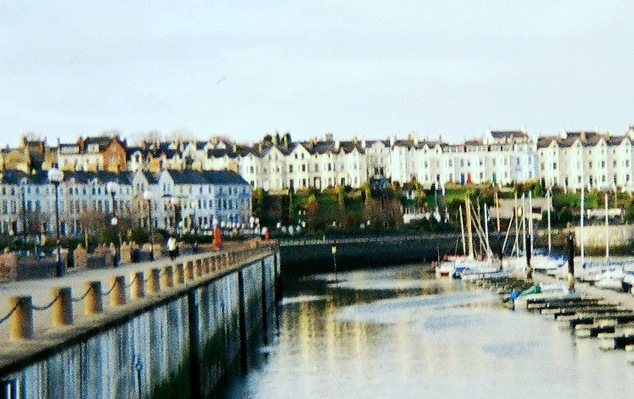 Since Mel spent part of today in Bangor, I decided to post this image from a photo I took of the Bangor marina one cold December day during my trip there last year. I cropped the photo to get a better view of the row houses, and adjusted the color to get a little more contrast between the yellow houses and the blue sky. 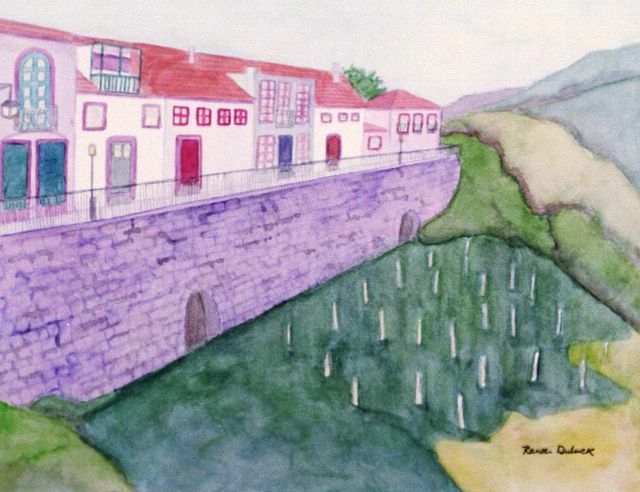 This is another of my watercolors of Portugal that is on display till Friday. 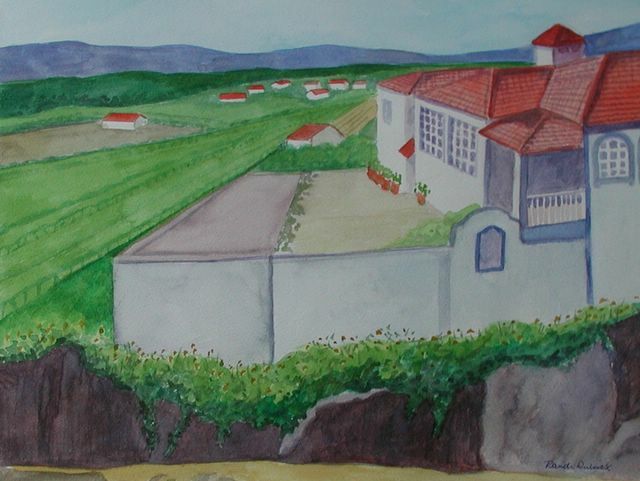 On one of my visits to Portugal, I took a quick photo of this farm in the countryside near Porto, and painted this picture when I got back home. 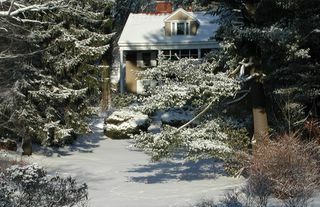 With my digital camera, I took a picture of the yard this morning, just as the sky cleared and turned pale yellow. 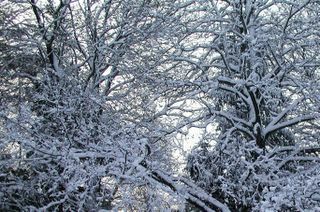 Then I cropped the photo to get this image of the intricacies of the branches against the morning sky. 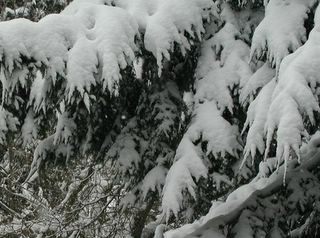 It's snowing again, great big flakes against a pink sky, and coming down fast, at least three inches already. I love the way the snow looks at night, but it is hard to capture night snow in a photograph. So tonight, I tried yet another experiment with my cell phone camera. I stood on the porch, and took a picture. The image was almost as much of a surprise as the snowfall. 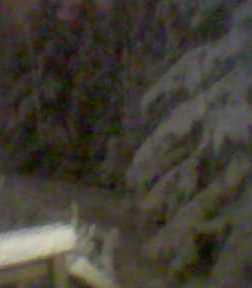 Despite (or because of) no flash, low resolution, and refracted light, the image gives a sense of the trees seen through falling snow in the dark, and even a bit of pink in the sky. I drew this pastel two years ago, and although the original pastel now belongs to someone else, I see this image quite often, because I use it on my business cards, and sometimes for greeting cards. An apple every day keeps you healthy. So does art. This is a first, a picture that I took today with my cell phone! We went to the beach to walk with the dogs. Even though the snow was piled up like crazy in the parking lot, the beach was beautiful. I was complaining that I didn't bring a camera, but Heather reminded me that my cell phone has a camera. I was sceptical about getting a good image, but tried it and here it is. I am happy with the colors, the sky and the composition. Just wish I could have captured the sounds of the ocean. Here is a self-portrait that I did in a portrait painting class a couple of years ago. It's hard to paint a self-portrait that doesn't look intense. 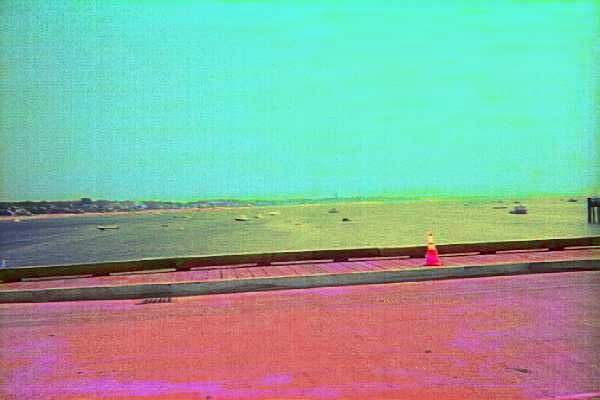 This usually has little to do with the artist's inner state, and everything to do with the concentration needed to be artist and model simultaneously. Besides, the self-portrait is often an assignment rather than a choice. 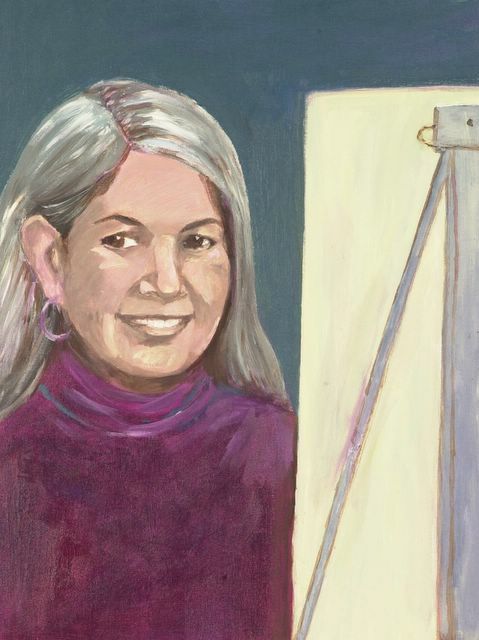 As for me, I love to paint portraits, and started doing portraits back in high school -- often when I was supposed to be doing something else, such as studying. 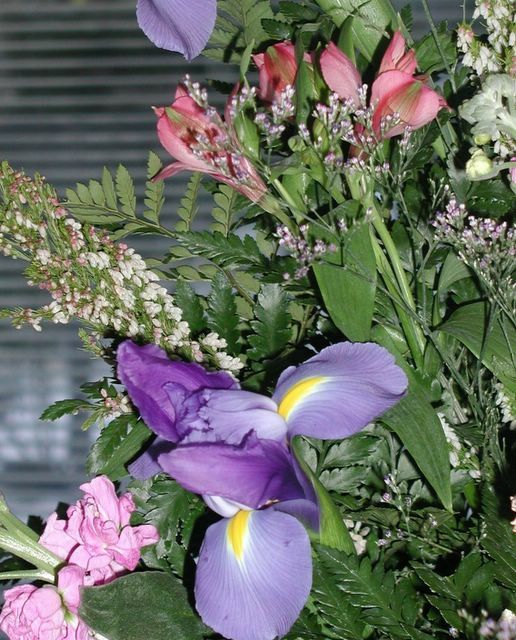 There's an art to arranging flowers, even in a photograph. 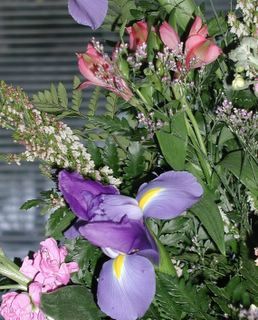 These arrived in late afternoon in a big basket. I took several photos but chose this one to post because I like the composition and the pattern of the leaves against the blinds in the background. How about a view of the beach? 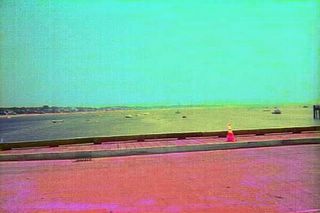 This is a photo of the Provincetown beach and boardwalk that a took during trip to Cape Cod one summer. Later, I colorized it to reflect the exuberance of the town. I am posting it today as an antidote for a gray winter day. 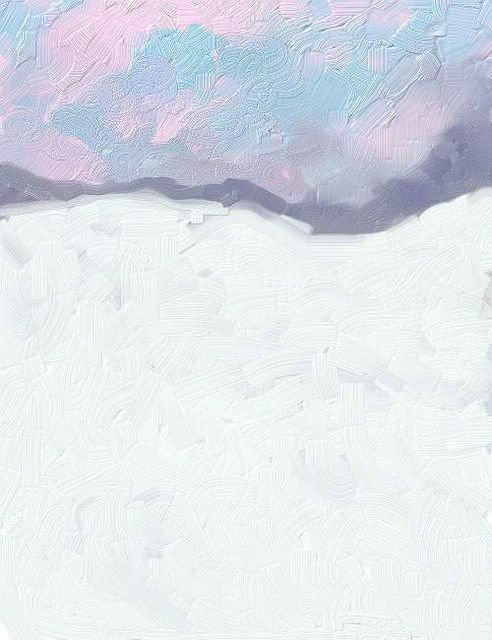 Last night around five pm, the sky turned bright blue and pink, and the image of that sky against the snow stayed in my head. So last night, I sat down at the computer and created this image, and finished it up today. I used Painter IX to make a digital oilpainting, and I have to say that cleanup was a breeze. 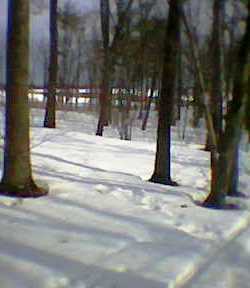 I took this photo before the big blizzard, but I am posting it today because although there is still a lot of snow on the ground, we have had several days of sun and blue sky, and this photo captures the brightness of the snow on a sunny day. 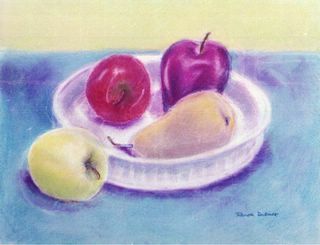 This is another of the watercolors that I put in my show yesterday. On my first trip to Portugal, I saw this wonderful little town on the border with Spain. I loved it, especially the row of houses and the wall. I took a lot of pictures, and when my trip was over, I did this watercolor, working from the photographs.